← How to print MHTML documents to PDF files? A ps (postscript) format is an image format that contains the controlling code for a postscript interpreter. Postscript describes the parameters for created images and make sure the display effects remain unchanged on different printing devices. PS format is widely used for high publication quality. A ps image file encapsules all required elements including fonts, text, graphics and controlling codes in one file, for presenting an invariable image effect. PS format stores image in vector and supports multiple pages in one single file. 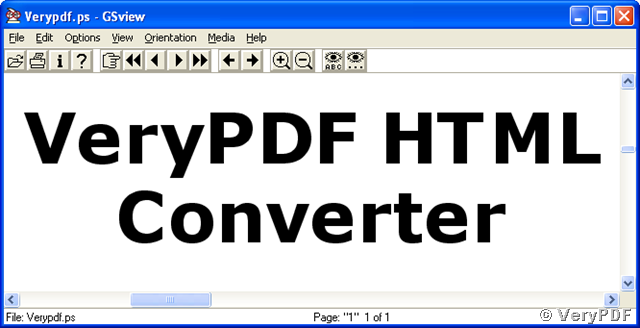 where “D:\htmltools\htmltools.exe” calls the conversion tool, “D:\htmltools\Verypdf.html” points to the source document and “D:\htmltools\Verypdf.ps” specifies the output file path “D:\htmltools\”, the name “Verypdf” and the conversion target format “ps”. The whole process of the conversion from html to ps can be looked up from the following screen snapshot. The converted image is stored in vector mode which will keep the image quality and support theoretically indefinite lossless scaling. The coming snapshot shows that the clarity and quality of the image is not degraded with graphic scale multiplied. How to rotate the page while converting url to gif?